One of the benefits of setting up your own business is the ability to choose how you spend your time. After spending the past week producing the final version of KCCG’s annual report and developing some exciting new projects (more of which later), on Friday I had the privilege of meeting 14 extraordinary young people who are taking part in this year’s Citizenship for Life programme. The award-winning Citizenship for Life (C4L) is the brainchild of Charlotte Caldwell, a former Cornwall Council colleague. She wanted to help young people who had experienced personal challenges such as bullying, bereavement and low self-confidence develop their life skills and understanding of what being a good citizen means. Now in its sixth year, and run by a community interest company which has Terry Waite CBE as its president, C4L selects a group of young people aged 13-14 from local secondary schools and then pairs each of them with a mentor from the business and public sectors. Both mentors and mentees then meet up for one day a month over a 12-month period to take part in a different activity linked to the theme of citizenship, including homelessness, the law, health, human rights and volunteering. Having enthusiastically accepted an invitation to become one of this year’s mentors, I swapped my work clothes and high heels for jeans and trainers and joined the other 13 mentors at the Bishop’s Forum Activity Centre to wait for our mentees. 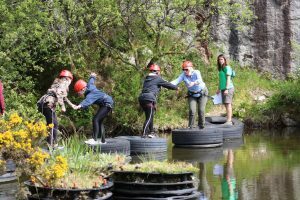 This first day was a “getting to know each other” session (we won’t know who we’ve been paired with until next month) – and what better way to do that than by rock climbing, abseiling and raft-building? Sadly (or possibly luckily), an injured shoulder prevented me from taking part in the more energetic activities, so I had to settle for providing noisy support. 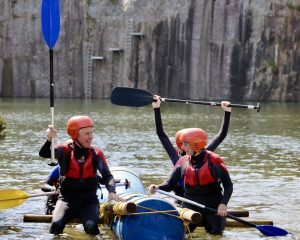 Despite not being able to shin up rock faces or paddle one of the fast-sinking rafts, it was an incredible day and I can’t wait for next month’s event. After years of working for the same organisation, the opportunity to choose who I want to work with and what I want to do is exhilarating. Part of my previous role involved working with schools and town and parish councils, and I’m really pleased to have been asked to help members of the Penzance Neighbourhood Plan group consult the public on their emerging proposals. Following the reopening of the Jubilee Pool, local groups and organisations have been working on ways to regenerate the town, and I’m looking forward to helping the group present their ideas to their local community over the coming months. I’ve also been asked to provide some training in media and public relations and the use of social media to primary headteachers later in the year. I was certainly hoping to have the opportunity to use my skills and experience in public sector communications in my new life, and it’s great to have been given this opportunity so soon. I can’t believe it is just six weeks since I left Cornwall Council and set up my new PR company Trisha Hewitt Communications. The past 12 months have been something of a roller coaster – at the age of 58 and after 28 years working for the same public sector organisation, I had certainly not expected to be taking on a totally new role running my own company. Definitely a giant leap into the unknown. But one thing I have learnt from the events of the past year is that life is too short to be unhappy. After 27 years of loving my job, things had changed and it was time to leave – however scary the future seemed. Luckily I have made some fantastic friends and colleagues over the past 28 years who sent me incredible messages of support when I announced what I was going and, in some cases, appeared to be even more excited than I was. 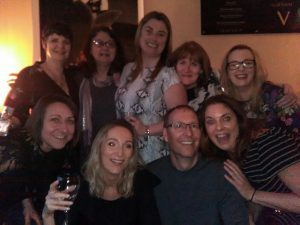 After posting positive messages on social media, many of these people joined me for my leaving drinks at Vertigo in Truro where we celebrated the end of one era and the beginning of a new one. So, what of the past six weeks? After sorting out the name of my new venture; designing my business cards ( thanks Hannah of HB Design); building my website – trishahewitt.com – (thanks Graham Smith of Cornwall Reports ); attending courses on how to set up your own business (thanks Outset Cornwall ); and buying a new laptop – I was ready to go. My first post council job has been helping NHS Kernow Clinical Commissioning Group to produce their annual report (after 28 years working for a local authority this is definitely something I know how to do!) While this may not appear to be the most exciting first new job it has been a really positive experience. I have loved working with the comms team – Laura, Caroline and Leanne – and all the other staff at KCCG, who have made me feel very welcome and I am looking forward to seeing the final document at the end of the month. I have also been providing communications support for a group who are developing their Neighbourhood Plan (another thing I know a little something about ) and have been working with Visit Cornwall to draft a bid for funding for a new ground breaking project. At the same time I have pitched for two other exciting projects – another first – and am waiting to hear back. The pitches may not be successful but at least I will have tried and it feels amazingly good to be taking risks and making my own decisions. My previous roles as a journalist and as a communications officer for one of the largest unitary authorities in the country have given me a wide range of skills and experience in all areas of public sector communications, together with a reputation for being good in a crisis ( after all I had plenty of practice at the council). You are never too old to change your life – you just need to believe you can do it. If you are willing to ask for help then all kinds of people will be happy to provide it. I know it is still early days for Trisha Hewitt Communications but the first six weeks have been very positive. As well as pitching for work, I have also been asked to join two charities which work with young people and families. My advice to anyone who is unhappy at work or just wants a new challenge – go for it.